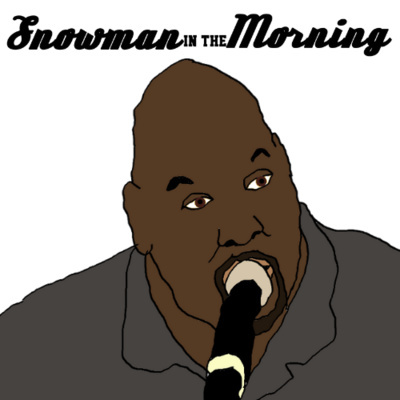 Snowman in the Morning is a 5-day a week podcast where we highlight the best in sports and speak TRUTH into sports talk. The BEST way to begin your day! Russell Westbrook, James Harden, LeBron James, and Ben Simmons are all regular season players! Snowman explains why! The Monday edition talking the key to DubNation, AFC and NFC South draft needs, and a lot more! Mike D'Abate joins the Monday show to talk draft needs of the AFC South and the NFC South - How bout them COLTS!!!! Mike D'Abate breaks it down! Who has more to lose? OKC or Indiana. Mr. ProPick and the Snowman break it down! We ran into a situation! Yeah, it involves the two-time Champs!!!! Mr. ProPick and the Snowman head to Texas for the Monday Pick of the Day! A little NCAA Hoops discussion - My producer extraordinaire Shane Lake poses the questions and ol' Snowman gives his answers! Bear's on the road on this Friday sharing stories with the Snowman - and a podcast title has come into play also! The Celtics and Lakers are a MESS! How is LeBron the blame for both teams? Listen in!!! The argument between LBJ and MJ is CLOSED!! Listen in as Snowman slams the door! Subscribe to our Patreon HERE! Precisely how great is Stephen Curry? How great can he be? Listen in! Snowman explains who the REAL MVP Candidates are in the NBA and why they won't get a sniff of a vote - a shame! Put the blame where it belongs Los Angeles! PERIOD!! Trey Snide joins the fun to talk some MLB Happenings!! For today's ProPick, we break down the Bucks and the Pacers from Innnnnnnnndianapolis, Indiana! An old segment - and an old friend returns! Congratulations Anthony Davis - you just played yourself!! Snowman gets you ready for the day! The hatred for Tom Brady is real. Robyn Vandenberg explains why! Robert Provera gives his thoughts on the Bucks/Pistons game. The Dubs and the Pacers meet in Indy - How does ProPicks see it? Robyn Vandenberg joins in to get a lot out! The Wednesday edition with a very special guest! Mike D'Abate joins in to talk NFL Week 17. The Dietz Sports Chatter gives a focus to football! Snowman explains why the Coach of the Year in college football went to the WRONG candidate! The Superback and the Snowman discuss the Bears/Packers tilt coming up on Sunday! The Professional Amateur joins in! Snowman explains how the 49ers can fix their red zone attack for the future!! Football and Volleyball gave me the best calls of the year so far! Time to say thanks!! Washington Redskins, you're on the clock! And under the microscope! What do you do? Andrew Luck should be in the MVP Conversation - Snowman explains why. Dub Nation Drama - Or is there? Brees is Better than Brady, NFL Week 12 Q and A and a visit from Chris Dietz!! It's the return of Snowman in the Morning and the Podcast Within!! UCF Gets no love - Be Prepared to be shocked!!! The Cubs season - and their run as we know it - is over! Snowman explains why! Da Bears, Da Colts, Da 163! All on the Monday Edition presented by Lakeshore Coffee and Specialties! Please support the podcast!! Full launch in 14 days!!!! TWO of them - TODAY!!! Snowman loves it! The Former Elston Red Devil joins the Snowman for a delightful conversation. Everything from sports broadcasting, different times of the student-athlete, and much more!! Chris Dietz and the Snowman explain why the Northwestern Wildcats are almost always swept under the radar! YES THE NORTHWESTERN WILDCATS!!!! James Harden? Why? And the Dubs NOT Organic? Oh a Snowman's not pleased!! Steve Willis previews the NFC happenings with the Snowman! Chris Dietz' special conversation with Jennifer Wenderoth-Holster... creator of the Let It Be Heard foundation... a support group for sexual abuse victims and domestic violence victims from Wednesday's 5th Down Sports Show. The Friday Football Festival as Steve Willis joins me to break down the NFC and AFC Division standings and Chris Dietz' special conversation with Jennifer Wenderoth-Holster... creator of the Let It Be Heard foundation... a support group for sexual abuse victims and domestic violence victims from Wednesday's 5th Down Sports Show. Ending the month with a repeat! Back LIVE on Wednesday morning! More Free Agency Conversation and Thank you Boogie!!! Snowman's fighting an illness, so this classic episode should fill ya up! The #DubNation Dynasty is HERE!!! DEAL WITH IT!!!! The Warriors' Dynasty is HERE! DEAL WITH IT!! !